It’s no secret that storms are seductive. 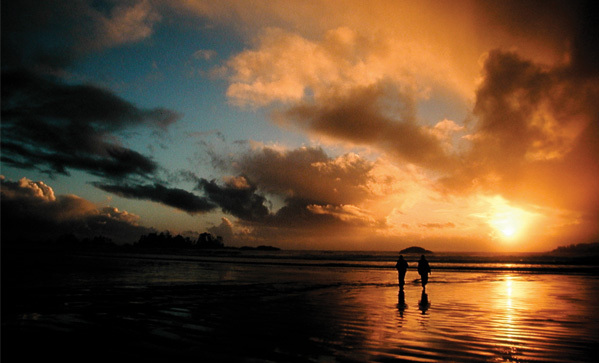 An (often rocky) hour flight aboard Orca Air and you’ll be in Tofino – the eye of Canada’s storm-watching capital and the perfect setting for a romantic weekend. Rest: Check in at the Wickaninnish Inn (a.k.a the Wick), a rustic-chic Relais & Chateaux property. Take in the stormy Pacific from your double soaker tub before cozying up by your fireplace with a glass of wine. Then, treat her to a side-by-side hot stone massage in the Cedar Sanctuary, a standalone cabin that practically rides the waves. Explore: If strolling through the Rainforest Loop Trail seems tame, take one of the Wick’s 2010 Lexus Hybrid RX 450h vehicles for a spin to Pacific Rim National Park. Eat: A seasonal meal at the Spotted Bear Bistro makes the trip into sleepy Tofino town centre worth it. Opt for the ever-changing six-course tasting menu. Surf: Chesterman Beach welcomes beginners and seasoned surfers alike. For lessons, visit Westside Surf School; if you’re ready to boogie, head to Live to Surf for rentals. Behold: You don’t have to leave your hotel to enjoy an impressive collection of West Coast art. Join the Sunday morning guided tour, and visit the artists at work in the carving shack on the beach. If you go to town, stop by Roy Henry Vickers’ Eagle Aerie Gallery and Sol Maya’s Spirit of the Fire glass blowing studio. Image courtesy of the Wickaninnish Inn.